Earlier in his career, Iceland left-back Ari Freyr Skúlason light-heartedly responded when asked what his new club should expect from him with ‘a crazy man running and fighting.’ Admittedly, the current Sporting Lokeren man brings a lot more to the party than bustle, although in life, football and music, the metronome never really stops ticking for the Euro 2016 ever-present. The impact of Icelandic players in the most respected leagues around the game has been felt for a very long time now, with some lifting the highest club honours along the way. It does, however, go without saying that last year was a watershed one in the pages of the national team’s story and the country’s sporting heritage, as the vast hordes of supporters from the North Atlantic island took a starring role in breathing magical life and adventure into Euro 2016. The team far surpassed outside expectations in reaching the last eight at its major tournament debut, chalking up famous victories over Austria and England en route. The Icelandic anthem ‘Lofsöngur,’ meanwhile, filled up the stadium air in Saint-Étienne, Marseille, Saint-Denis and Nice, adding more than a sprinkling of wonderment for much of the watching audience around the world. 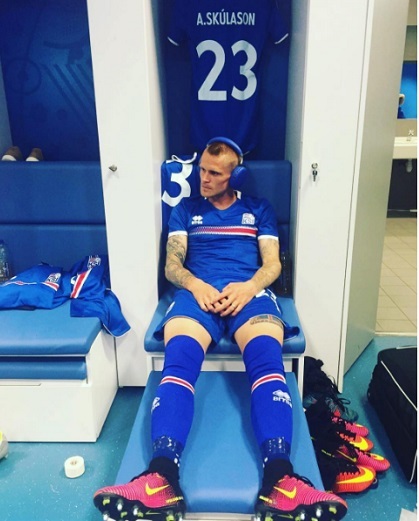 Despite the familiarity the wider football public already had with certain names in the ranks, it was a first chance for many to watch and get to know some of the varied and intriguing personalities that make up the Icelandic squad, which had climbed to an all-time high of 20th in the FIFA rankings this February. One of those was Ari Freyr Skúlason, the versatile 29-year-old who was out there for every minute of the competition for Lars Lagerbäck and Heimir Hallgrímsson’s men, patrolling the left-back station. Throughout their participation, the sounds went with the story for the team, and for Ari especially, music goes along with him every step, helping drown out the distractions for the Lokeren defender. A self-described ‘football fanatic,’ Ari is an energetic player who gets forward from full-back to add his incisive delivery as often as he can, as well as a goal or two here and there. Spending much of his club career in Sweden before a recent stint in Denmark and now Belgium, his capabilities were often utilised in midfield before becoming recognised as a regular left-back option for his country ultimately led him to taking on the best that traditional international heavyweights France, England and Portugal had to offer last summer. The Icelandic celebrations joined in by fans and players were among the most enduring scenes of the Euros, with the synchronised ‘thunderclap’ gaining widespread intrigue and almost earning as much attention as the team (and that’s saying something). Maybe that was the most memorable section of the soundtrack for the public, but behind the scenes, Ari explains how it’s a Burnley midfield man who dictates the rhythm. “Jóhann Berg Guðmundsson is the one who controls the music, but some of the guys put on headphones and listen to their own music. He is not a bad DJ, just sometimes you need your own music. That scene of triumph has of course become much more familiar for Iceland in recent times, marked in particularly striking fashion by commentator and one-time national team forward Guðmundur ‘Gummi Ben’ Benediktsson, who was also elevated to international stardom after his characteristically delirious reaction to the wins over Austria and England. Along with that last-16 England victory which made waves and headlines around the world, Iceland had taken down some tournament regulars in qualifying for the competition. The 3-0 home win over Turkey in Reykjavík started the ball rolling in September 2014 and the team essentially just went from there, increasingly beginning to truly believe what they were capable of. Long-time former Sweden co-manager Lars Lagerbäck had helped dramatically raise the wider professionalism of the national team setup after his 2011 arrival, which included introducing a private chef for the team and chartered flights for the bigger games for the first time. Ari has previously pinpointed how the players began to leave behind the feeling of just targeting a point in many of their games, and as well as World Cup 2002 and Euro 2008 semi-finalists Turkey, they also toppled the Netherlands in the group – twice. Having beaten Latvia 3-0 in Riga, Gylfi Sigurðsson’s brace set them on their way to a 2-0 home win over the Dutch, before the Swansea City midfielder struck again with the solitary goal from the penalty spot in the return fixture in Amsterdam to complete a crucial double. Qualification was sealed with a goalless draw at home to Kazakhstan, with Iceland ultimately finishing runners-up to the Czech Republic as they became the smallest nation to make a major tournament, with a population of around 332,000. Having the best defence in the group was crucial (only six conceded in ten), as was their aforementioned Dutch double, and the Netherlands was actually where Ari’s club career first took him away from home. He had been a youngster at the Reykjavík–based Valur before going to Heerenveen as a 16-year-old. Ari would have two years at the one-time UEFA Champions League participants before returning to Valur while still a teenager. Born in the Icelandic capital, he remembers the music influences he was surrounded by back home while the football dream was in its infancy. “I have an older brother so I always listened to his CDs or my father’s, but the first album I bought was Linkin Park ‘Hybrid Theory’ and I was 13 years old. Half a season after returning to Valur and representing the first team in the top flight, Ari headed to Sweden to join BK Häcken, and despite relegation from the top-tier Allsvenskan, the club gained entry to the UEFA Cup qualifiers via the Fair Play Award. It was in that qualifying round in August 2007 that Ari struck the decisive goal in the second leg in Gothenburg to eliminate Scottish side Dunfermline and send Häcken into the first round. After notable spells with another Swedish side, GIF Sundsvall, and Danish club Odense Boldklub (OB), the Sint-Niklaas district of East Flanders is where you currently find Ari, currently in his first season with Sporting Lokeren of the Belgian First Division A. Although last summer for Icelandic players, staff and fans alike arguably rivalled anything a music show could spark in terms of moments of euphoric unity, Ari already has something marked down for summer 2017 that will surely at least help bring a tiny piece of that back! “My wife and I are going to see U2 live in Brussels this summer and I’m very excited about that; my favourite band. I really wanted to see Michael Jackson and Queen live; I have music DVDs of them and they are the best artists when it comes to live shows. With Häcken not returning to the top division, Ari signed for the Allsvenskan’s GIF Sundsvall in 2008, where he’d feature in midfield and remain with the club for five years. Wearing the captain’s armband during that time, as he would also go on to do with OB, he signed off spectacularly with two free-kicks in a 3-3 draw with GAIS. In his years playing in blue at Norrporten Arena, Ari had a midfield teammate with a little more going on away from the field than most. The former Swedish youth international now wears the number eight for Djurgårdens IF, although in 2013 he was celebrating a major individual success in front of a national television audience, as Ari explains. On his way to winning the show, half-Irish Walker, whose single ‘Belong’ went top 10 in Sweden after his Idol win, sang ‘Pride (In the Name of Love)’ and ‘Where the Streets Have No Name’ from Ari’s favourites, U2. Millions have dreamed of being a footballer or a rock star, and there are certainly a select few who have surfed between the lines of both, with varying results! Ari has the tattoos and the taste for the rockier side sometimes, but has he ever been forced to take centre-stage in front of his fellow players when joining a new team? “Yeah, I have done it two times, and it’s my biggest fear to sing in front of people – I hate it! Both times, I sang ‘Síðan Hittumst Við Aftur’ by SSSól, an Icelandic band. So if he had to record a song cover, with one or more teammates permitted to help him out, it’s little wonder who Ari would turn to, given he has a ready-made pro waiting in the wings. While the country’s highest league, the Úrvalsdeild, isn’t fully professional, Icelanders’ love for football is undoubtedly substantial, as evidenced by the many who’ve gone on to forge careers in the game throughout the years and decades. In more recent times, efforts have been ramped up to give young players a greater chance of thriving, with the introduction of numerous indoor pitches earlier this century to go with the full-size artificial pitches outdoors around the country. Today’s indoor facilities allow the possibility of training the whole year round and the sports halls are accessible for most hours during the day, while Iceland is recognised for its high standard of youth coaches. Of course the circumstances are different in so many ways, but the close-knit connection shared by the Icelandic team is not all that dissimilar to what Spain notably had during their recent golden period, when even players who were fierce club rivals had deep friendship, respect and football understanding with each other from their youth national team days together. Former Chelsea and Barcelona forward Eiður Gudjohnsen has famously flown the flag at the very highest level, and there is more reason than ever for lovers of the game in Iceland now to look to their own as the footballing inspirations and idols, following a summer for the national team that naturally sky-rocketed the profile of the whole group. There is a midfield creator and goalscorer who was already known to many overseas, after multiple seasons spent in the Premier League. 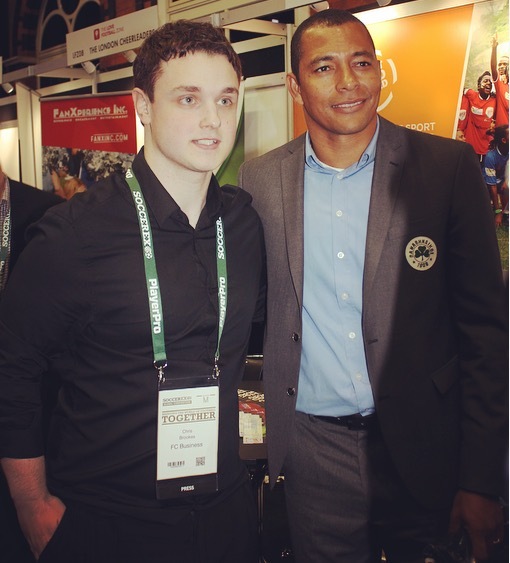 As Ari was asked which player from all-time he’d want to practice shooting with if he had a training field to himself, the man with set-piece precision and an eye for the magnificent got his vote, though not before Ari made sure they had someone between the posts – a guitar-playing GIF Sundsvall teammate who still plays there. “First, I would choose Tommy Naurin, my best friend from Sweden, to be in goal, and then Gylfi Sigurðsson to shoot with. Tommy is a goalie and I love scoring against him, plus he’s my best mate. Approaching a half-century of caps, Ari was the regular left-back as Iceland finished group runners-up to Switzerland before narrowly missing out on the 2014 World Cup after Mario Mandžukić and Darijo Srna’s second-leg playoff goals in Croatia. He was a debutant against Iran back in 2009 under Ólafur Jóhannesson, but would feature more after the 2011 arrival of current Norway boss Lagerbäck, who was in joint-charge alongside Heimir Hallgrímsson from 2013 to 2016. 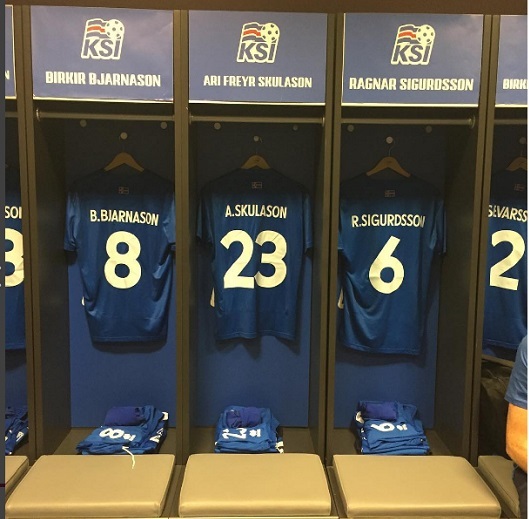 Captaining the team for the first time against Sweden in 2014, Ari played the entirety of Iceland’s five games at the Euros, including as they stunned winners Portugal by coming back to draw 1-1 through Birkir Bjarnason in the Saint-Étienne opener. There would be the ultra-dramatic 2-1 victory over Austria to close out the group after Arnór Ingvi Traustason’s 94th-minute finish set up that famous meeting with England in Nice. 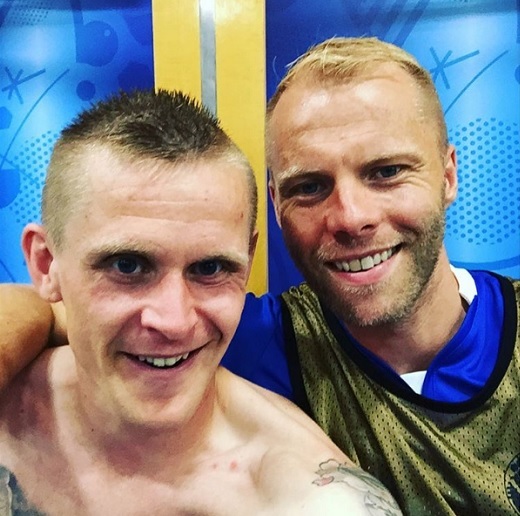 Ragnar Sigurðsson and Kolbeinn Sigþórsson’s goals and the efforts from front to back saw off the Three Lions that night, and while hosts France were too much in the quarter-final, Birkir Bjarnason did ensure they had the last word in a 5-2 result in front of 76,833 at the Stade de France. While all that was going on, the youngest of Ari and wife Erna’s three children, baby daughter Camilla, had her own introduction to fame. After the France game, the images of her in pink noise protection headphones while her dad held her captured the attention on social media and probably broke most people’s cuteness barometer in the process! By now, Ari knows all about what he does best on the field and despite a touch of injury setback frustration at Lokeren, he has again shown his ability to create and even finish himself, playing for manager and all-time Iceland cap holder Rúnar Kristinsson. 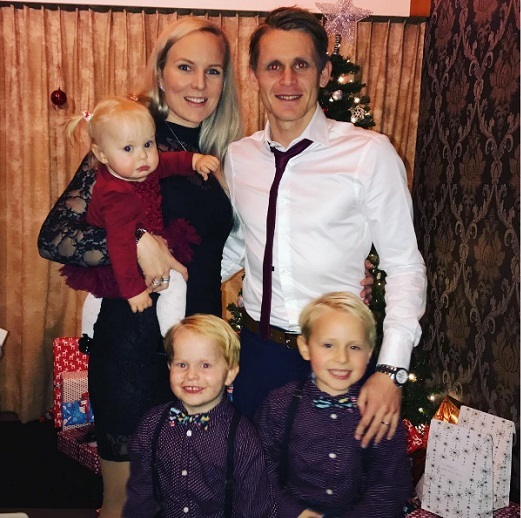 A calf issue had forced him off in a game with Standard Liège on December 21st but he returned two months later and will be optimistic about coming up with more moments like his December goal at Waasland-Beveren, when he weaved in from the left to cut a finish across into the far corner. Taking a step back far enough to focus not just on the results on the pitch, he’s a person who left his homeland as a teen to pursue his career and has since experienced life in five different countries. He has also just been an important part of a major run for his nation that won legions of fans for them around the globe, while he has a young family of his own to raise, with sons of five (Henry Leo) and three years old (Gabriel Eli) to go with Camilla. When he stops to think about it, what has this game that is such a vehicle for uniting people and bringing happiness taught him the most? More specifically, what would be on his mind to pass on to the young Ari, if he got to talk to him now? “Oh that’s a tough question. I would say be mentally strong, because you are not always going to have a good game, so be ready for criticism on the way. Having joined Lokeren after the Euros, Ari is in the first season of his three-year deal with the club and is currently with the team as they prepare for their domestic playoff games. This format gives them the chance to earn a Europa League third qualifying round place, having finished 11th in the regular top-tier campaign, and they will compete in Group B against the 8th, 10th, 13th and 15th-place finishers, as well as the Belgian First Division B runners-up. The format for our final question is much simpler! Ari has made his name in stadiums around Europe and some of the memories made at Iceland’s home stadium of Laugardalsvöllur and in France will be locked away in the trophy cabinet of his mind for good. On here, though, we take it to the 5-a-side playground to finish up each interview. Last year, the Italian town of Pieve di Cento, just north of Bologna, became unlikely Skúlason fanatics, developing a fascination with Ari and his progress with the national team, as his last name is a term of amazement in local dialect. Many bought Iceland jerseys bearing his name and there was a celebration held for him, with hordes of people coming out to honour his achievements at the Euros. There was even a petition signed by over 4,500 to award Ari honorary citizenship in Pieve di Cento, so perhaps they’d come out to see him in this game! It is a small-sided match and Ari can select any four teammates from his career so far to be on his team of five. There are no set rules on whether the interviewee chooses the outright ‘best’ they have ever worked with, or if they prefer to base their choices on personal connection with that player, memories they have shared with them, or even just for the fun factor or small-sided ability they would bring. With one Swede, one Dane and two fellow Icelanders, Ari breaks down the Skúlason starting group! “Goalie: Tommy Naurin. Tommy knows how football works; not a typical goalie. “Defender: Ragnar Sigurðsson. Ragnar is technically a very strong defender and used to play as a midfielder in his younger years. “Midfielder: Rasmus Falk. Rasmus is the best footballer I have played with in club football – what a talent this guy is.